Construct a LEGO® brick model of one of the world's most famous palaces. Located in the heart of London, Buckingham Palace has housed Britain's sovereigns since 1837, when it became the official residence of Queen Victoria, just three weeks after her accession to the throne. The building has since played host to state visits, investitures and private audiences, and in 2015 opened its doors to the general public, offering state room tours. This detailed LEGO model focuses on the palace's monumental, neoclassical facade—designed by architect Sir Aston Webb in 1913, and features the famous balcony, forecourt and palace gates. A section of the Mall including a red double-decker bus, black cab and the Victoria Memorial completes the model, capturing the essence of the magnificent palace and one of the world's most dynamic cities. Price is 12% below the initial Lego retail price, a € 7.04 discount! This comes down to 6.79 cent per brick. The Buckingham Palace (21029) Lego set is available from the sites below. However, they do not offer delivery to your selected region. 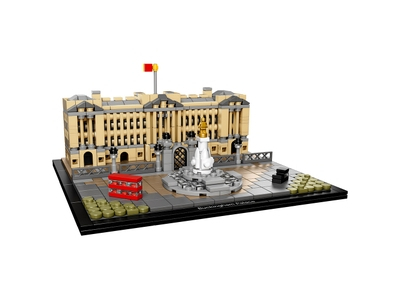 The Buckingham Palace (21029) Lego set is no longer directly available from the sites below. However, 3rd party partners of these sites might still have the set available. Alternate description Experience Buckingham Palace with this detailed LEGO® Architecture interpretation of London's iconic royal residence, complete with the Victoria Memorial, bus and a taxi. LEGO® Architecture interpretation of the real-world architectural landmark, Buckingham Palace. Features the neoclassical facade of the palace's east wing and includes the Royal Standard flag, forecourt and palace gates, plus a section of the Mall with Victoria Memorial, red double-decker bus and a black taxicab. This set includes over 700 LEGO® pieces. Measures 3” (10cm) high, 7” (20cm) wide and 7” (19cm) deep.